Sat., May 20, 2017, 12:56 p.m.
More of your friends and neighbors get regular stress-reduction therapy than you might realize. Of course, they don’t actually call it that. They just say they are taking the dog for a walk. But who could deny that this seemingly simple daily activity abounds with mood and mindset benefits? Except now we carry plastic bags. It stands to reason that walking the dog blows off a lot of steam. You could argue that, along with the occasional “Thank you” wave from a stranger in traffic, it’s the one thing keeping society relatively sane. Sure, there are those who probably regard walking the dog as a thankless chore, just one more thing on their already overbooked to-do lists. Maybe that’s because they just don’t understand. Taking your dog for a walk isn’t some onerous burden. It is an opportunity. An opportunity that might not present itself if the daily or twice-daily outings were not a built-in part of your schedule. Ever heard that whimpering sound dogs make when they have been sitting on ready for 15 minutes? Ignore it at your peril. So it’s a daily invitation to get up, get out and clear your head. Perhaps it might be different if all we thought about while walking the dog was, well, walking the dog. Of course, that’s not how it is. You could imagine a partial transcript of the daydreams on the human end of the leash. On any given day, it might show that the two-legger had thought about a personality clash at work, anticipated a vacation in Italy, visualized kissing a certain someone’s neck, worried about money, planned to get in better shape, critiqued a neighbor’s weed infested lawn, fretted about an aging relative’s health, tried to remember where that blood pressure monitor got stashed, reconsidered the ending of a movie, and come up with a list of household projects to tackle or avoid this summer. Now you need not be walking a dog to have a procession of unrelated themes cross your mind. But how often during your day are you more emphatically invited to think about whatever than when leaning over to scoop up your pet’s warm droppings? Yes, there are people who spend every second they are out walking looking at their phones. Or talking on their phones. Or texting on their phones. To each his own. But you have to wonder if dog-walking time really ought to be reserved for undirected stream-of-consciousness mental meandering. Or for chance social encounters or simply keeping up with various comings and goings in your neighborhood. One thing dog walkers know that some others don’t is that to really get an accurate picture of what is going on around where you live, it’s sometimes necessary to get out and actually look around. Of course, it’s not always one human and one canine. Sometimes dog walking happens in clusters. But the classic scenario involves just two participants. This can involve a constant power struggle over who is in control of the leash. It can be like trying to land a barking swordfish or fly a yapping kite. Or it can be a calm partnership of well-traveled friends. The latter can be a contemplative constitutional. It’s a time-honored pair bond. No need to get excited. No need to strain. It’s just two family members out taking the air, mulling whatever comes to mind and sniffing what needs to be sniffed. 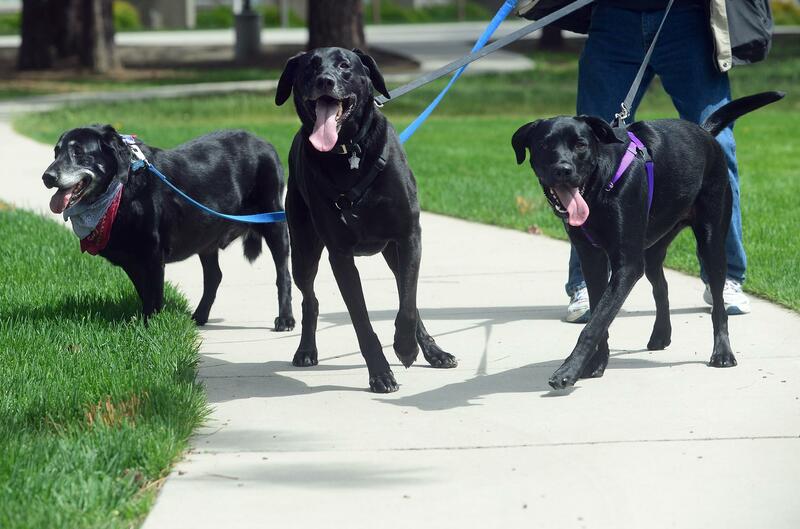 There’s a widely held perception that walking the dog happens because the dogs require it. And certainly, they do. But what about the human half of the equation? Maybe they need it almost as much. Sure, there’s the gentle exercise. Still, it’s different than simply taking a walk by yourself. Taking a walk with your dog can be therapeutic in ways that aren’t always easy to explain. When friendship and loyalty have been expressed mostly without words over the years, a certain intuitive familiarity and regard develop. Being in the presence of such a relationship is the opposite of being alone. Eventually, the dog gets old. It slows down, no longer walking as far or as fast. The dog’s person adjusts, allowing his or her four-legged friend to set the pace. This is when walking the dog becomes more of a sacrament than a routine. How many more times will the two of you pick up the leash and head out the back door? How many more times will the attentive human watch for a sign from the valued pet that says “Let’s head home,” and instantly obey? More than a few aspects of life in 2017 pull us toward a scattered, hectic way of life. But walking the dog can be a timeless refuge from pings and updates and the insistence of social media. Dogs don’t care about any of that, of course. They just want your love. When you think of all they give us, it’s not too much to ask. Like it says in those ads for scotch whisky, keep walking. Published: May 20, 2017, 12:56 p.m.